BETHLEHEM, P.A. 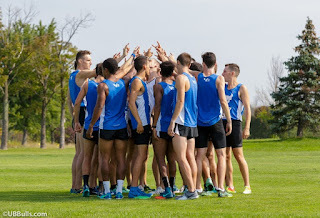 -- The University at Buffalo Cross Country programs built upon their early successes this season as both the Men's and Women's teams competed in various events at the Paul Short Invitational hosted by Lehigh University in Bethlehem, PA. In the Open Men's 8k event, the Bulls finished second overall and were led by senior Dylan Servos who crossed the line in 12th place overall with a time of 25:56. Finishing just behind Servos in 13th place was freshman Michael Hannon clocking in at 25:58 with junior Matthew Mercer on his heels, clocking in at 26:01, good for 15th place. Freshman Ryan Buzby and sophomore Patrick Hazlitt also had impressive showings for the Bulls, crossing the line in 23rd (26:12) and 28th (26:19). Senior Justin Van Epps and sophomore Justin Schramm closed out the top 30 in a deep field of 437 runners, finishing in 28th and 30th place respectively. In another strong showing, Bulls Men's team placed 13th overall out of a very competitive field of 40 teams in the Gold Men's 8k event. Continuing to add to his resume in his impressive 2018 campaign, redshirt-sophomore Caleb Covell spearheaded Buffalo's efforts, crossing the line in 23rd out of a field of 358 runners with a time of 24:53. Junior Liam Hilbert also ran hard for the Bulls, coming in 43rd place with a time of 25:13. For the Buffalo Women in the Brown Women's 6k event, the youthful Bulls impressed finishing in ninth place overall in a field of 43 teams. Leading the way for the Buffalo Women was senior Lauren Reyda, securing a top-10 finish with 9th overall, crossing the line with a time of 21:41. Freshman Riley Jones also had a strong race for the Bulls, finishing in 49th out of 331 runners with a time of 22:53. The Bulls return to action on October 13th as they are set to compete in the Canisius Alumni Invite.